Knowledge related to sulfur isotopic composition of carbonyl sulfide (OCS or COS), the most abundant atmospheric sulfur species, remains scarce. We present a new sampling system for collecting approx. 10 nmol of OCS from ambient air coupled with a purification system. The system presented herein is useful for application of sulfur isotopic compositions for investigation of OCS sources and sinks in the troposphere to elucidate its cycle and its contribution to background stratospheric sulfate. Unique and spectacular under water speleothems termed as Hells Bells where recently reported from sinkholes (cenotes) of the Yucatán Peninsula, Mexico. However, the mystery of their formation remained unresolved. Here, we present detailed geochemical analyses and delineate that the growth of Hells Bells results from a combination of biogeochemical processes and variable hydraulic conditions within the cenote. In this study we investigated marine algae as a source of CH4 in oxic surface waters of oceans. Algae-derived CH4 may explain the CH4 oversaturating state within the surface mixed layer, sometimes also termed the "oceanic methane paradox". This finding of an overlooked source of CH4 in marine environments will be of considerable importance to scientists in many disciplines because algae play a crucial role in organic matter cycling in marine and freshwater ecosystems. Plants are known as a source of methane (CH4), but the biochemical mechanisms involved in CH4 formation are still unknown. Employing 13C-labelled methionine clearly identified the sulfur-bound methyl group of methionine as a carbon precursor of CH4 released from lavender plants. When relating CH4 emission rates to dark respiration of intact plants, we found a molar CH4:CO2 emission ratio of 2.0 ±1.1 (pmol:µmol). After physical stress CH4 release rates greatly increased. The photochemical oxidation of organic compounds in the atmosphere results in the formation of important secondary pollutants such as ozone and fine particles. The extent of oxidation the organic compounds have been subjected too since there emissions is essential is key for understanding the formation of secondary pollutants. This paper demonstrates that measurements of the carbon isotope ratios allow determining the extent of photochemical processing for individual compounds. We present experimental kinetic isotope effects (KIE) for the OH oxidation of CH3D and 13CH3D and their temperature dependence. 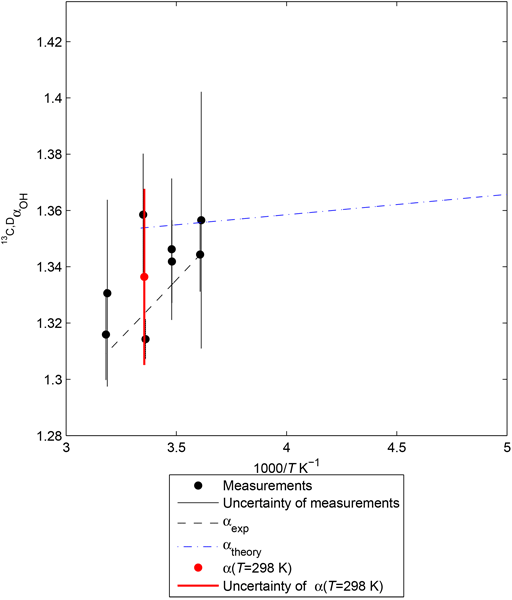 Our determination of the 13CH3D + OH KIE is novel and we find no "clumped" isotope effect within the experimental uncertainty. We evaluate isotopic composition of NO3- in different environments across East Antarctica. At high snow accumulation sites, isotopic ratios are suggestive of preservation of NO3- deposition. At low accumulation sites, isotopes are sensitive to both the loss of NO3- due to photolysis and secondary formation of NO3- within the snow. The imprint of post-depositional alteration is not uniform with depth, making it difficult to predict the isotopic composition at depth from near-surface data alone. Anderson, R. S., Huang, L., Iannone, R., Thompson, A. E., and Rudolph, J.: Carbon Kinetic Isotope Effects in the Gas Phase Reactions of Light Alkanes and Ethene with the OH Radical at 296±4 K, J. Phys. Chem. A, 108, 11537–11544, https://doi.org/10.1021/jp0472008, 2004. Anderson, R. S., Huang, L., Iannone, R., and Rudolph, J.: Measurements of the 12C∕13C Kinetic Isotope Effects in the Gas-Phase Reactions of Light Alkanes with Chlorine Atoms, J. Phys. Chem. A, 111, 495–504, https://doi.org/10.1021/jp064634p, 2007. Asner, G. P., Powell, G. V. N., Mascaro, J., Knapp, D. E., Clark, J. K., Jacobson, J., Kennedy-Bowdoin, T., Balaji, A., Paez-Acosta, G., Victoria, E., Secada, L., Valqui, M., and Hughes, R. F.: High-resolution forest carbon stocks and emissions in the Amazon, P. Natl. Acad. Sci. USA, 107, 16738–16742, https://doi.org/10.1073/pnas.1004875107, 2010. Baccini, A., Goetz, S. J., Walker, W. S., Laporte, N. T., Sun, M., Sulla-Menashe, D., Hackler, J., Beck, P. S. A., Dubayah, R., Friedl, M. A., Samanta, S., and Houghton, R. A.: Estimated carbon dioxide emissions from tropical deforestation improved by carbon-density maps, Nat. Clim. Change, 2, 182–185, https://doi.org/10.1038/nclimate1354, 2012. 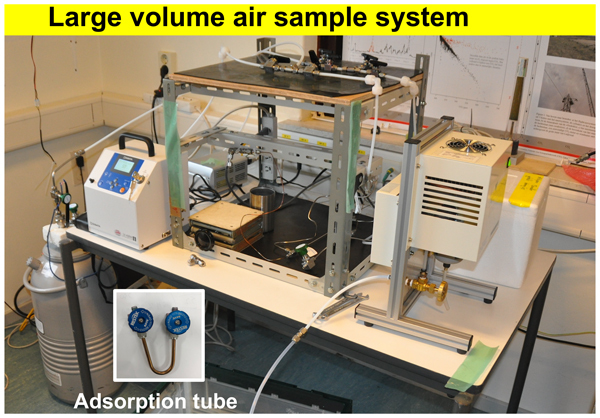 Bahlmann, E., Weinberg, I., Seifert, R., Tubbesing, C., and Michaelis, W.: A high volume sampling system for isotope determination of volatile halocarbons and hydrocarbons, Atmos. Meas. Tech., 4, 2073–2086, https://doi.org/10.5194/amt-4-2073-2011, 2011. Behnke, W., Holländer, W., Koch, W., Nolting, F., and Zetzsch, C.: A smog chamber for studies of the photochemical degradation of chemicals in the presence of aerosols, Atmos. Environ., 22, 1113–1120, 1988. Blei, E., Hardacre, C. J., Mills, G. P., Heal, K. V., and Heal, M. R.: Identification and quantification of methyl halide sources in a lowland tropical rainforest, Atmos. Environ., 44, 1005–1010, https://doi.org/10.1016/j.atmosenv.2009.12.023, 2010. Burkholder, J. B., Sander, S. P., Abbatt, J., Barker, J. R., Huie, R. E., Kolb, C. E., Kurylo, M. J., Orkin, V. L., Wilmouth, D. M., and Wine, P. H.: Chemical Kinetics and Photochemical Data for Use in Atmospheric Studies, Evaluation No. 18, JPL Publication 15-10, Jet Propulsion Laboratory, Pasadena, USA, 2015. Butler, J. H.: Better budgets for methyl halides?, Nature, 403, 260–261, https://doi.org/10.1038/35002232, 2000. Buxmann, J., Balzer, N., Bleicher, S., Platt, U., and Zetzsch, C.: Observations of bromine explosions in smog chamber experiments above a model salt pan, Int. J. Chem. Kinet., 44, 312–326, 2012. Cantrell, C. A., Shetter, R. E., McDaniel, A. H., Calvert, J. G., Davidson, J. A., Lowe, D. C., Tyler, S. C., Cicerone, R. J., and Greenberg, J. P.: Carbon kinetic isotope effect in the oxidation of methane by the hydroxyl radical, J. Geophys. Res.-Atmos., 95, 22455–22462, https://doi.org/10.1029/JD095iD13p22455, 1990. Carpenter, L. J., Reimann, S., Burkholder, J. B., Clerbaux, C., Hall, B., Hossaini, R., Laube, J., and Yvon-Lewis, S.: Update on Ozone-Depleting Substances (ODSs) and Other Gases of Interest to the Montreal Protocol, chap. 1, in: Scientific Assessment of Ozone Depletion, Global Ozone Research and Monitoring Project Report, World Meteorological Organization (WMO), Geneva, Switzerland, 21–125, 2014. Chave, J., Riéra, B., and Dubois, M.-A. : Estimation of biomass in a neotropical forest of French Guiana: spatial and temporal variability, J. Trop. Ecol., 17, 79–96, https://doi.org/10.1017/S0266467401001055, 2001. Chave, J., Olivier, J., Bongers, F., Châtelet, P., Forget, P.-M., van der Meer, P., Norden, N., Riéra, B., and Charles-Dominique, P.: Above-ground biomass and productivity in a rain forest of eastern South America, J. Trop. Ecol., 24, 355–366, https://doi.org/10.1017/S0266467408005075, 2008. Czapiewski, K. v., Czuba, E., Huang, L., Ernst, D., Norman, A. L., Koppmann, R., and Rudolph, J.: Isotopic Composition of Non-Methane Hydrocarbons in Emissions from Biomass Burning, J. Atmos. Chem., 43, 45–60, https://doi.org/10.1023/a:1016105030624, 2002. DeMore, W. B.: Rate constant ratio for the reactions of hydroxyl with methane-d and methane, J. Phys. Chem., 97, 8564–8566, https://doi.org/10.1021/j100135a006, 1993. Elsner, M., Zwank, L., Hunkeler, D., and Schwarzenbach, R. P.: A New Concept Linking Observable Stable Isotope Fractionation to Transformation Pathways of Organic Pollutants, Environ. Sci. Technol., 39, 6896–6916, https://doi.org/10.1021/es0504587, 2005. Farquhar, G., O'Leary, M., and Berry, J.: On the Relationship Between Carbon Isotope Discrimination and the Intercellular Carbon Dioxide Concentration in Leaves, Funct. Plant Biol., 9, 121–137, https://doi.org/10.1071/PP9820121, 1982. Feilberg, K. L., Griffith, D. W. T., Johnson, M. S., and Nielsen, C. J.: The 13C and D kinetic isotope effects in the reaction of CH4 with Cl, Int. J. Chem. Kinet., 37, 110–118, https://doi.org/10.1002/kin.20058, 2005. Food and Agriculture Organization of the United Nations: Global Forest Resource Assessment 2012, Rome, Italy, ISBN 978-92-5-107292-9, 2012. Food and Agriculture Organization of the United Nations: Global Forest Resources Assessment 2015, Rome, Italy, Desk Reference, ISBN 978-92-5-108826-5, 2015. Gebhardt, S., Colomb, A., Hofmann, R., Williams, J., and Lelieveld, J.: Halogenated organic species over the tropical South American rainforest, Atmos. Chem. Phys., 8, 3185–3197, https://doi.org/10.5194/acp-8-3185-2008, 2008. Greule, M., Huber, S. G., and Keppler, F.: Stable hydrogen-isotope analysis of methyl chloride emitted from heated halophytic plants, Atmos. Environ., 62, 584–592, https://doi.org/10.1016/j.atmosenv.2012.09.007, 2013. Hu, L., Yvon-Lewis, S. A., Butler, J. H., Lobert, J. M., and King, D. B.: An improved oceanic budget for methyl chloride, J. Geophys. Res.-Oceans, 118, 715–725, https://doi.org/10.1029/2012JC008196, 2013. Jalili, S. and Akhavan, M.: The study of isotope effects of chloroform and chloromethane using vibrational frequencies, J. Mol. Struct., 765, 105–114, https://doi.org/10.1016/j.theochem.2006.03.011, 2006. Kaiser, J., Engel, A., Borchers, R., and Röckmann, T.: Probing stratospheric transport and chemistry with new balloon and aircraft observations of the meridional and vertical N2O isotope distribution, Atmos. Chem. Phys., 6, 3535–3556, https://doi.org/10.5194/acp-6-3535-2006, 2006. Kato, R., Tadaki Y., and Ogawa, H.: Plant biomass and growth increment studies in Pasoh Forest, Malay. Nat. J., 30, 211–224, 1978. Keppler, F., Bahlmann, E., Greule, M., Schöler, H. F., Wittmer, J., and Zetzsch, C.: Mass spectrometric measurement of hydrogen isotope fractionation for the reactions of chloromethane with OH and Cl, Atmos. Chem. Phys., 18, 6625–6635, https://doi.org/10.5194/acp-18-6625-2018, 2018. Köhl, M., Lasco, R., Cifuentes, M., Jonsson, Ö., Korhonen, K. T., Mundhenk, P., de Jesus Navar, J., and Stinson, G.: Changes in forest production, biomass and carbon: Results from the 2015 UN FAO Global Forest Resource Assessment, Forest Ecol. Manage., 352, 21–34, https://doi.org/10.1016/j.foreco.2015.05.036, 2015. Komatsu, D. D., Tsunogai, U., Yamaguchi, J., Nakagawa, F., Yokouchi, Y., and Nojiri, Y.: The budget of atmospheric methyl chloride using stable carbon isotopic mass- balance, Poster A51C-0784, AGU Fall Meeting, 13–17 December 2004, San Francisco, USA, 2004. Lee-Taylor, J. M., Brasseur, G. P., and Yokouchi, Y.: A preliminary three-dimensional global model study of atmospheric methyl chloride distributions, J. Geophys. Res., 106, 34221–34233, 2001. Merrigan, S. R., Le Gloahec, V. N., Smith, J. A., Barton, D. H. R., and Singleton, D. A.: Separation of the primary and secondary kinetic isotope effects at a reactive center using starting material reactivities. Application to the FeCl3-catalyzed oxidation of C-H bonds with tert-butyl hydroperoxide, Tetrahedron Lett., 40, 3847–3850, 1990. Miller, L. G., Kalin, R. M., McCauley, S. E., Hamilton, J. T. G., Harper, D. B., Millet, D. B., Oremland, R. S., and Goldstein, A. H.: Large carbon isotope fractionation associated with oxidation of methyl halides by methylotrophic bacteria, P. Natl. Acad. Sci., 98, 5833–5837, https://doi.org/10.1073/pnas.101129798, 2001. Miller, L. G., Warner, K. L., Baesman, S. M., Oremland, R. S., McDonald, I. R., Radajewski, J., and Colin Murell, J.: Degradation of methyl bromide and methyl chloride in soil microcosms: Use of stable C isotope fractionation and stable isotope probing to identify reactions and the responsible microorganisms, Geochim. Cosmochim. Ac., 68, 3271–3283, 2004. Monzka, S. A., Reimann, S., Engel, A., Krüger, K., O'Doherty, S., Sturgres, W. T., Blake, D., Dorf, M., Fraser, P., Froidevaux, L., Jucks, K., Kreher, K., Kurylo, M. J., Mellouki, A., Miller, J., Nielsen, O.-J., Orkin, V. L., Prinn, R. G., Rhew, R., Santee, M. L., Stohl, A., and Verdonik, D.: Ozone-Depleting Substances (ODSs) and Other Gases of Interest to the Montreal Protocol, chap. 1, in: Scientific Assessment of Ozone Depletion, Global Ozone Research and Monitoring Project Report, World Meteorological Organization (WMO), Geneva, Switzerland, Report 52, 2010. Morgan, C. G., Allen, M., Liang, M. C., Shia, R. L., Blake, G. A., and Yung, Y. L.: Isotopic fractionation of nitrous oxide in the stratosphere: Comparison between model and observations, J. Geophys. Res., 109, D04305, https://doi.org/10.1029/2003JD003402, 2004. Penman, H. L.: Gas and vapour movements in the soil: I. The diffusion of vapours through porous solids, J. Agr. Sci., 30, 437–462, https://doi.org/10.1017/S0021859600048164, 1940. Pereira Jr., L. R., de Andrade, E. M., Palácio, H. A. d. Q., Raymer, P. C. L., Filho, C. R., and Pereira, R. S.: Carbon stocks in a tropical dry forest in Brazil, Revista Ciência Agronômica, 47, 32–40 2016. Piansawan, T., Saccon, M., Vereecken, L., Gensch, I., and Kiendler-Scharr, A.: Temperature dependence of stable carbon kinetic isotope effect for the oxidation reaction of ethane by OH radicals: Experimental and theoretical studies, J. Geophys. Res.-Atmos., 122, 8310–8324, https://doi.org/10.1002/2017JD026950, 2017. Prinn, R. G., Weiss, R. F., Fraser, P. J., Simmonds, P. G., Cunnold, D. M., Alyea, F. N., O'Doherty, S., Salameh, P., Miller, B. R., Huang, J., Wang, R. H. J., Hartley, D. E., Harth, C., Steele, L. P., Sturrock, G., Midgley, P. M., and McCulloch, A.: A history of chemically and radiatively important gases in air deduced from ALE/GAGE/AGAGE, J. Geophys. Res.-Atmos., 105, 17751–17792, https://doi.org/10.1029/2000JD900141, 2000. Redeker, K. R. and Kalin, R. M.: Methyl chloride isotopic signatures from Irish forest soils and a comparison between abiotic and biogenic methyl halide soil fluxes, Glob. Change Biol., 18, 1453–1467, https://doi.org/10.1111/j.1365-2486.2011.02600.x, 2012. Redeker, K. R., Davis, S., and Kalin, R. M.: Isotope values of atmospheric halocarbons and hydrocarbons from Irish urban, rural, and marine locations, J. Geophys. Res.-Atmos., 112, D16307, https://doi.org/10.1029/2006JD007784, 2007. Rudolph, J., Czuba, E., and Huang, L.: The stable carbon isotope fractionation for reactions of selected hydrocarbons with OH-radicals and its relevance for atmospheric chemistry, J. Geophys. Res.-Atmos., 105, 29329–29346, https://doi.org/10.1029/2000JD900447, 2000. Saatchi, S. S., Houghton, R. A., Dos Santos Alvalá, R. C., Soares, J. V., and Yu, Y.: Distribution of aboveground live biomass in the Amazon basin, Glob. Change Biol., 13, 816–837, https://doi.org/10.1111/j.1365-2486.2007.01323.x, 2007. Saito, T., Yokouchi, Y., Kosugi, Y., Tani, M., Philip, E., and Okuda, T.: Methyl chloride and isoprene emissions from tropical rain forest in Southeast Asia, Geophys. Res. Lett., 35, L19812, https://doi.org/10.1029/2008GL035241, 2008. Saito, T., Yokouchi, Y., Phillip, E., and Okuda, T.: Bidirectional exchange of methyl halides between tropical plants and the atmosphere, Geophys. Res. Lett., 40, 5300–5304, https://doi.org/10.1002/grl.50997, 2013. Saltzman, E. S., Aydin, M., De Bruyn, W. J., King, D. B., and Yvon-Lewis, S. A.: Methyl bromide in preindustrial air: Measurements from an Antarctic ice core, J. Geophys. Res.-Atmos., 109, D05301, https://doi.org/10.1029/2003JD004157, 2004. 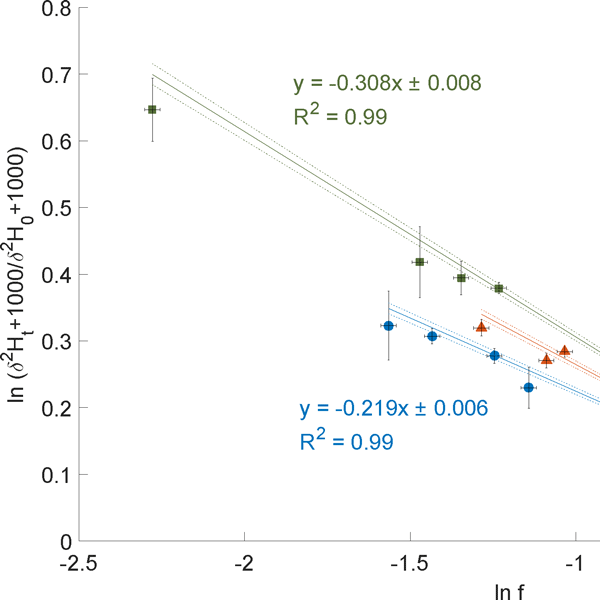 Saueressig, G., Bergamaschi, P., Crowley, J. N., Fischer, H., and Harris, G. W.: Carbon kinetic isotope effect in the reaction of CH4 with Cl atoms, Geophys. Res. Lett., 22, 1225–1228, https://doi.org/10.1029/95GL00881, 1995. Saueressig, G., Crowley, J. N., Bergamaschi, P., Brühl, C., Brenninkmeijer, C. A. M., and Fischer, H.: Carbon 13 and D kinetic isotope effects in the reactions of CH4 with O(1D) and OH: New laboratory measurements and their implications for the isotopic composition of stratospheric methane, J. Geophys. Res.-Atmos., 106, 23127–23138, https://doi.org/10.1029/2000JD000120, 2001. Shorter, J. H., Kolb, C. E., Crill, P. M., Kerwin, R. A., Talbot, R. W., Hines, M. E., and Harriss, R. C.: Rapid degradation of atmospheric methyl bromide in soils, Nature, 377, 717–719, https://doi.org/10.1038/377717a0, 1995. Tans, P. P.: A note on isotopic ratios and the global atmospheric methane budget, Global Biogeochemical Cycles, 11, 77-81, https://doi.org/10.1029/96GB03940, 1997. Thompson, A. E., Anderson, R. S., Rudolph, J., and Huang, L.: Stable carbon isotope signatures of background tropospheric chloromethane and CFC113, Biogeochemistry, 60, 191–211, https://doi.org/10.1023/a:1019820208377, 2002. Trudinger, C. M., Etheridge, D. M., Sturrock, G. A., Fraser, P. J., Krummel, P. B., and McCulloch, A.: Atmospheric histories of halocarbons from analysis of Antarctic firn air: Methyl bromide, methyl chloride, chloroform, and dichloromethane, J. Geophys. Res.-Atmos., 109, D22310, https://doi.org/10.1029/2004JD004932, 2004. Tsunogai, U., Yoshida, N., and Gamo, T.: Carbon isotopic compositions of C2–C5 hydrocarbons and methyl chloride in urban, coastal, and maritime atmospheres over the western North Pacific, J. Geophys. Res.-Atmos., 104, 16033–16039, https://doi.org/10.1029/1999JD900217, 1999. Tyler, S. C., Ajie, H. O., Rice, A. L., Cicerone, R. J., and Tuazon, E. C.: Experimentally determined kinetic isotope effects in the reaction of CH4 with Cl: Implications for atmospheric CH4, Geophys. Res. Lett., 27, 1715–1718, https://doi.org/10.1029/1999GL011168, 2000. Wanninkhof, R.: Relationship between wind speed and gas exchange over the ocean revisited, Limnol. Oceanogr.-Meth., 12, 351–362, https://doi.org/10.4319/lom.2014.12.351, 2014. Weinberg, I., Bahlmann, E., Eckhardt, T., Michaelis, W., and Seifert, R.: A halocarbon survey from a seagrass dominated subtropical lagoon, Ria Formosa (Portugal): flux pattern and isotopic composition, Biogeosciences, 12, 1697–1711, https://doi.org/10.5194/bg-12-1697-2015, 2015. Xiao, X., Prinn, R. G., Fraser, P. J., Weiss, R. F., Simmonds, P. G., O'Doherty, S., Miller, B. R., Salameh, P. K., Harth, C. M., Krummel, P. B., Golombek, A., Porter, L. W., Butler, J. H., Elkins, J. W., Dutton, G. S., Hall, B. D., Steele, L. P., Wang, R. H. J., and Cunnold, D. M.: Atmospheric three-dimensional inverse modeling of regional industrial emissions and global oceanic uptake of carbon tetrachloride, Atmos. Chem. Phys., 10, 10421–10434, https://doi.org/10.5194/acp-10-10421-2010, 2010. Yamakura, T., Hagihara, A., Sukardjo, S., and Ogawa, H.: Aboveground biomass of tropical rain forest stands in Indonesian Borneo, Vegetatio, 68, 71–82, available at: https://link.springer.com/article/10.1007/BF00045057 (last access: 4 February 2019), 1986. Yokouchi, Y., Noijiri, Y., Barrie, L. A., Toom-Sauntry, D., Machida, T., Inuzuka, Y., Akimoto, H., Li, H. J., Fujinuma, Y., and Aoki, S.: A strong source of methyl chloride to the atmosphere from tropical coastal land, Nature, 403, 295–298, https://doi.org/10.1038/35002049, 2000. Yoshida, Y., Wang, Y., Shim, C., Cunnold, D., Blake, D. R., and Dutton, G. S.: Inverse modeling of the global methyl chloride sources, J. Geophys. Res.-Atmos., 111, D16307, https://doi.org/10.1029/2005JD006696, 2006. Zhang, L., Brook, J. R., and Vet, R.: A revised parameterization for gaseous dry deposition in air-quality models, Atmos. Chem. Phys., 3, 2067–2082, https://doi.org/10.5194/acp-3-2067-2003, 2003.